Choose your own enhanced multiples! The Playa Premium League offers the highest odds for Match Winner Markets (Final Score) and Over/Under 2.5 Goals Markets (Total Goals 0-2 and 3+). With the Playa Premium League, you the customer can choose your own enhanced multiples. That means you are getting the best price in the country on a multiple bet of your choice! Why must we choose the matches for YOU! We are stretching these markets like crazy and you wont find prices like these anywhere! The Premium League is available weekly during the standard football season. 1. Firstly, Select “Premium League” in the soccer markets section. 3. 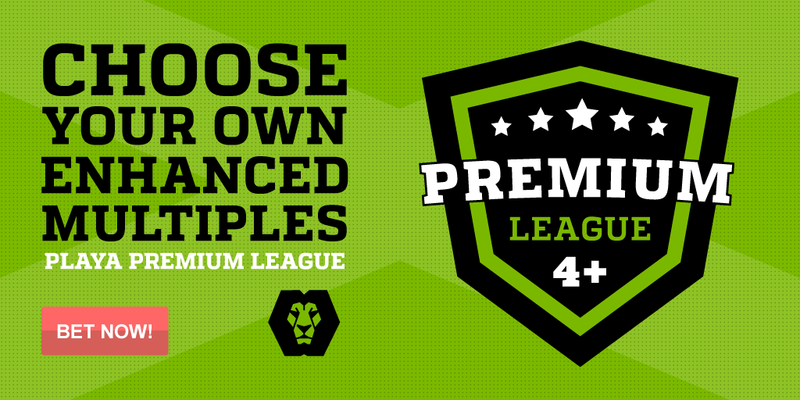 You must select a minimum of 4 teams from the Premium League to create your enhanced multiple. (If you select 3 teams or less, you will not be able to take the bet). 4. You cannot combine Premium League teams with any other football league or sporting event. All events can only be from the Premium League fixtures. 7. Final Score and Total Goal market standard betting rules apply.